United Way Australia -along with the Centre for Social Impact’s Director Andrew Young -recently launched its first Community Impact Report to representatives of the corporate, trust and foundations, government and community sectors. United Way’s Community Impact Manager, Jenny Riley offers her take-outs from the event. United Way Australia -along with the Centre for Social Impact’s Director Andrew Young -recently launched its first Community Impact Report : ‘Collaborating for change: Our Journey so far’ to representatives of the corporate, trust and foundations, government and community sectors. United Way’s Community Impact Manager, Jenny Riley offers her take-outs from the event. “In the last 20 years as a country we haven’t made anywhere near enough progress in resolving a wide range of sustained social issues. With the challenges we face in the coming decades, we have to start a cultural shift right now – we must be far more targeted with defining our intended outcomes, measuring and reporting progress, and being more open about what we are achieving and what we could do better. We congratulate United Way for taking the first steps on the journey of reporting lessons learnt”. Andrew Young, Centre for Social Impact. 1. What has worked in collaboration projects? The key themes emerging from the group included the importance of early planning in the collaboration, stakeholder engagement and a clear, focused common agenda. – Doing fewer things better with depth. – An exit strategy and appropriate timelines. Some of the good examples of collaboration included the 90 Homes for 90 Lives imitative, ABC Learning Centers and the Bendigo Well-being and Children report. Nous Victoria Project with 13 NFP to benchmark the performance of their back-of-house functions. 2. What do you think about the approach to documenting learning? The approach to learning was seen as a positive move forward for the social sector to improve practice, especially to innovate, identify who else needs to be at the table and identify what is sustainable/scalable and successful i.e. as demonstrated by The Young Foundation. However, documenting learning is not without risks in our current operating environment. In the competitive environment of tenders and grants, grantees want to share success rather than failure and are concerned of putting up their hand ‘and being cut down’. This fear of sharing lessons learnt publically is flat-lining progress for the sector. One participant reflected that annual reports are more about marketing than actual reporting. It was proposed that grantees need support to learn and fail rather than be placed in a position where they overpromise and under-deliver on grants. There was a call for the sector to engage critical friends and action learning approaches. Good examples of documenting learning included the Telstra Foundation Report and Freehills undertaking end of case reviews – what worked, what didn’t. 3. How can we improve our thinking about/reporting of outcomes? Two themes emerged in how we can improve reporting of outcomes. Firstly was the design and secondly was at an institutional/sector level. Understanding the outcomes required to achieve the intended impact. Having control groups or some way to understand the counter-factual. Including hard and soft outcomes as well as short-term versus long-term outcomes. Understanding the funder-grantee outcome relationship i.e. funders can tend to rely on their NGO partners outcomes rather than their own outcomes. The honest and frank discussion by the group in the room was a breath of fresh air for many of the participants who reported to feeling connected and inspired. It was a reminder that we need continually put our heads up and ask what are we doing, why we are doing it, are we achieving what we set out to achieve and could we be doing it better? 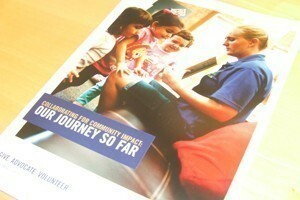 To view United Way’s first Community Impact Report click here.